Up there with Tom Waits, Stephin Merritt and Nick Cave, Dan Bejar, aka Destroyer, creates music that challenges listeners, excites critics and delights fans like nothing else. We mentioned the issue of polarizing artists when discussing Girl Talk earlier this week and Bejar has a somewhat similar effect on music fans though unlike Gillis, Bejar music often perplexes many more listeners than it polarizes. While Bejar’s talk-sing delivery of strangely poetic, abstract lyrics is off-putting to the average listener, it should come as no surprise that these elements are exactly what endears Bejar to his extremely devoted fans. 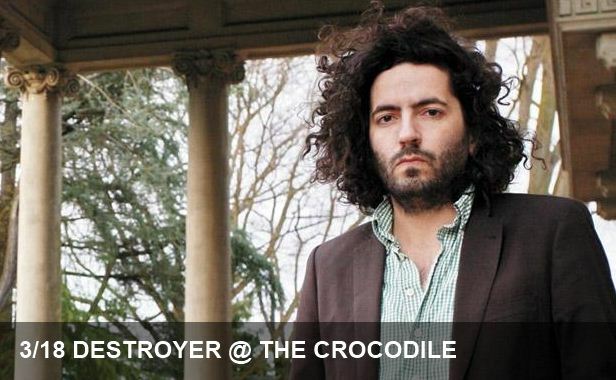 Erstwhile member of New Pornographers, Bejar will be bringing the beloved/bemoaned Destroyer to The Croc tonight to promote his latest album, Kaputt. Seattle’s own Yuni in Taxco and then Philadelphia’s The War on Drugs will get things warmed up before the popular Bejar’s popular Vancouver outfit takes the stage.